Caroline Wimberly is a Program Associate at Brighter Green. She began her work at Brighter Green as an intern in February 2011. She graduated from Duke University in 2007 with an AB in Art History and minors in Psychology and Religion. She moved to New York City in 2008 to attend the French Culinary Institute, not only to strengthen her culinary skills, but also to learn about the food industry. She also worked for a year as the event planner at Artisanal Bistro. While she (mostly) enjoyed working in the restaurant industry, she is devoted to animal welfare issues, as well as sustainable agricultural practices and fair food pricing. Caroline has attended COP22 and COP23 on behalf of Brighter Green, leading conversations and facilitating dialogue about animal agriculture’s role in climate change and connecting with partners to build larger momentum for policy action. She has worked on the post-production of two documentaries, What’s for Dinner? and Six Years On, as well as other short videos, and has coordinated the China Program since its official beginning in 2014. Outside of the office, she dabbles in green home renovations and interior design, impact investing, and local activism. She hopes to encourage more people to adopt a whole foods, plant-based diet, as well as educate people about the animal agriculture industry. Emily Lavieri-Scull is a Program Coordinator at Brighter Green. She began working with Brighter Green in August 2015. She graduated from Vassar College in 2015 with a BA in Psychology. She moved to New York City shortly after graduation to explore her passion for environmental issues, animal rights, and food. 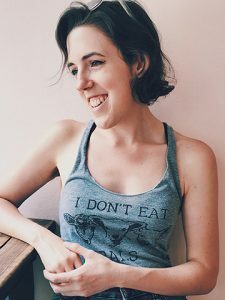 Emily also works for Lantern Books as a Publishing Associate, The Green Belt Movement as the Communications and Operations Coordinator, and the Culture & Animals Foundation as the Website Coordinator and Social Media Director. While not working, she enjoys photography, cooking and blogging about vegan meals, which she shares here, and hanging with animals. Miao Jie is the Chinese Social Media Manager at Brighter Green. 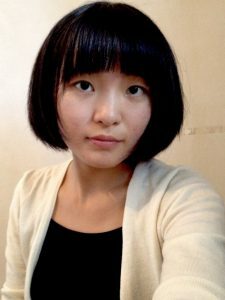 She is a freelance educator and documentarian based in Jiangxi, China. She holds a BA in English from Jinggangshan University in Jiangxi Province. For the past few years she has been working, first as a volunteer and later as an intern, with IFChina Original Studio, a local NGO that aims to collect social memories. Miao joined the What’s for Dinner? Wechat social media campaign at the beginning of 2015 and since has worked extensively on Chinese-English and English-Chinese translation. She leads a vegan lifestyle and is passionate about issues related to the globalization of animal agriculture and how they affect the lives of ordinary citizens.